A stellar team display and an immense attack inside the final seven kilometers propelled the Belgian to his biggest career victory. 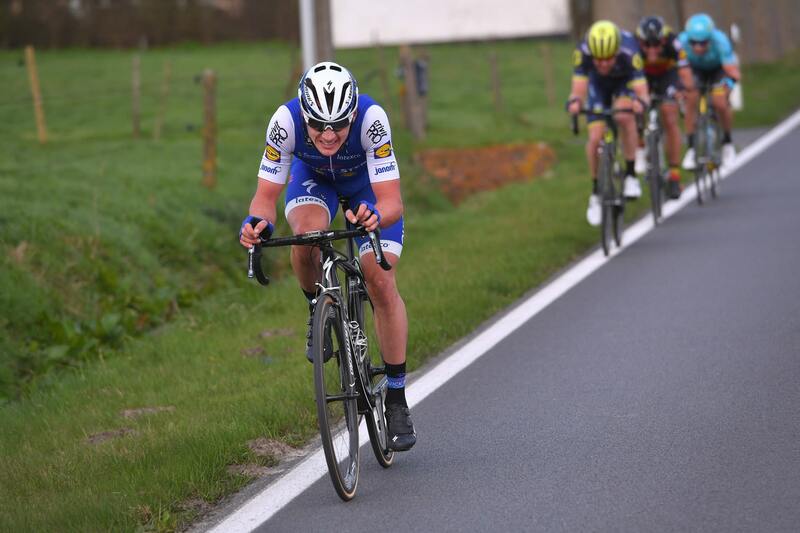 Quick-Step Floors owned the 72nd edition of Dwars door Vlaanderen, which this year made its debut in the World Tour calendar, taking 1-2 in Waregem with Yves Lampaert and Philippe Gilbert. Our team stamped its authority on the Belgian classic right from the beginning, when powerhouse Tim Declercq hit the front of the peloton and put in some mammoth turns, thus bringing down the advantage of the six men who managed to escap the clutches of the bunch after 20 kilometers. 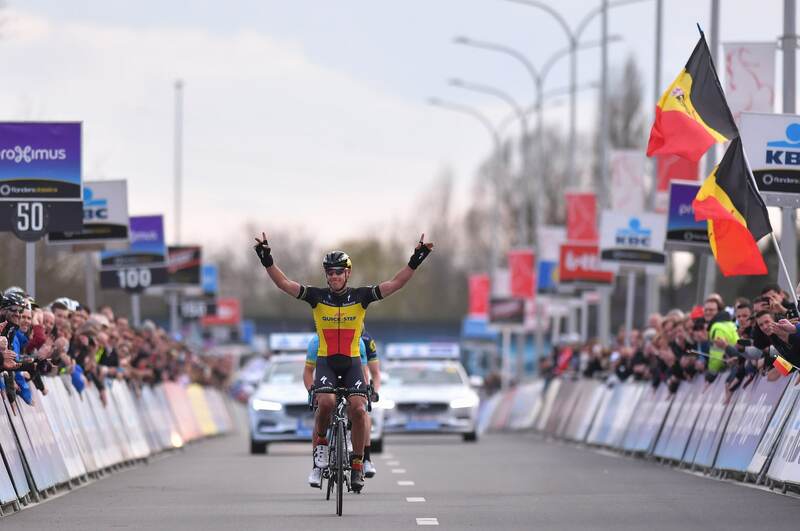 Belgian Champion Philippe Gilbert, who was racing Dwars door Vlaanderen for the first time since 2004, instigated a move with 78 kilometers to go on Berendries, forcing a selection which saw around 20 riders extricating themselves from the peloton and establishing a 30-second lead. Behind, Cannondale-Drapac, FDJ and Trek-Segafredo led the chase, but their effort was to no avail, as Gilbert and Yves Lampaert, who too was part of the group, worked hard to keep them at bay. On Eikenberg, Yves attacked, and even though he was reeled in over the top of the climb, his action still produced some damage, as the front group was reduced to 12 men. At one point, it looked like the peloton will come back, with the gap dropping to 20 seconds, but the same Quick-Step Floors riders ensured the move will stick, and as a result they tackled the Oude Kwaremont with a 40-second lead. It was on the steep and brutal Paterberg that Philippe showed his class and put the hammer down, taking with him only three riders: Yves, Luke Durbridge (Orica-Scott) and Alexey Lutsenko (Astana). Behind, the peloton got fragmented and Zdenek Stybar and Niki Terpstra took advantage of this and of the tough terrain to go in pursuit of the first chasing group, to which they bridged inside the last 25 kilometers. Final climb of the day – Nokereberg – had the Belgian Champion in the spotlight, as he pulled clear over the top of the hill and opened a five-second gap before the others came back on his wheel. Herlegemstraat was the race’s last hurdle, and on the long cobblestone stretch Yves struck a move which left Durbridge and Lutsenko speechless. In the blink of an eye, the advantage grew to 30 seconds, and long before “Lampy” went under the flamme rouge it became clear he’ll nab his biggest victory since turning pro. Philippe Gilbert led home the chasers, making it a memorable 1-2 for Quick-Step Floors at Dwars door Vlaanderen and taking the outfit managed by Patrick Lefevere at the top of the World Tour standings after nine events. “To win a World Tour classic in the Quick-Step Floors kit gives me an amazing feeling. I can’t tell you how happy I am for myself and for the team. Together with Philippe, who proved again today what a huge champion he is, we did a superb job”, said Yves Lampaert after his maiden World Tour victory, one which came not far from his home. 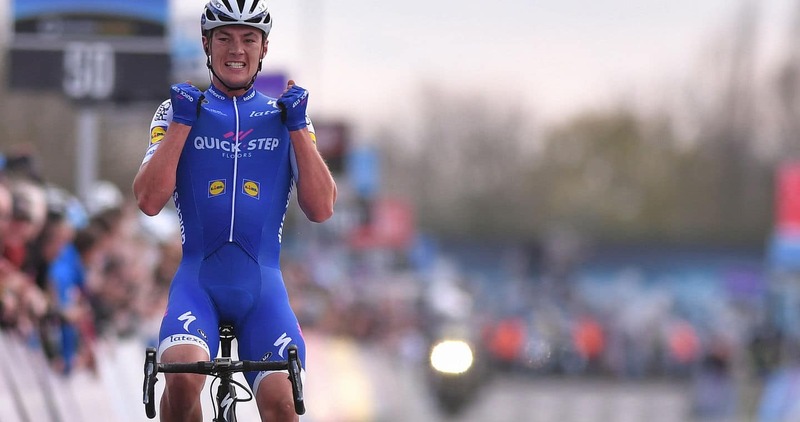 This was for the first time since 2012 that Quick-Step Floors nabbed the top two positions in a Belgian race. Back then, it happened at the same Dwars door Vlaanderen, with Niki Terpstra and Sylvain Chavanel. Now, it was Philippe Gilbert who made the team’s day perfect, by sprinting to second from the chasing group.